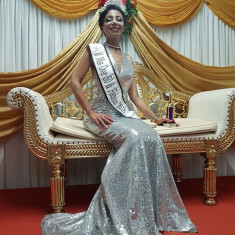 The Miss Over 50 & Fabulous Pageant has been designed to enrich the lives of mature women and also tap into their energy to help enrich the lives of others. Our current generation of mature adults generally enjoy better physical health, financial comfort and social respect than did their predessors. This pageant will provide the basis for motivating mature women to lead an active and productive lifestyle. This is the foremost pageant to give honour to women who have reached the age of elegance, it is a search for the gracious lady who best exemplifies the dignity, maturity and inner beauty of today's mature women with the knowledge, experience and resources that the younger generation can succeed to have the opportunity to help build a better society.